I love a clean bathroom - I seriously do. I didn't have this fetish as a kid, but I have begun to appreciate more and more just a clean mirror, a spotless toilette, and a clean floor. The only thing that should be yellow in a bathroom is a rubber ducky. Like the upscale hotels look - shiny fixtures, little packets of fun stuff, and 20 plushy towels for each person. The idea of relaxing and just having a good time is so appealing. Aaaaaaaahhhhhhhhhhhh. You can't relax in a stinky room though. Smell is a major factor; I love a bathroom that smells like fresh linens, a tinge of bleach and just fresh fresh fresh. Almost minty. Not like what you smell at a truck stop. Or your gramma's bathroom. I have nightmares of those bathrooms that are so overwhelmingly perfumed with "rose" or anything gagalicous that makes you have to hold your breath so you won't be nauseous. Bleeeh. 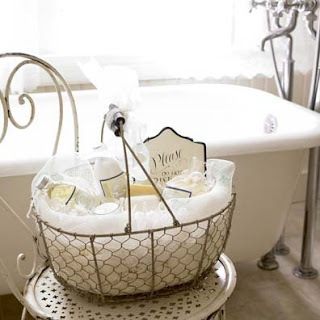 After I clean my bathroom I spray my favorite perfume over the light bulbs - a little light and airy touch. Back when we had tile, I'd also use mouthwash to scrub it down. Tastes nasty, smells wonderful, and minty fresh. The bane though would have to be the floors. Between my long hair and a drippy 4 yr old boy, I just hate dealing with the floor. I've found a way around it though: vacuum. I vacuum the tile before I clean it, and it's so delightful to see spare tissue and hair go straight up the tube. MUCH easier than broom and pan. Our current bathroom is so small that I can use the spray bleach and a rag and just hand wipe the floor in less than two minutes (timing is everything - I don't want to be doing this FOREVER...), and the dirty rags go straight in the wash. It's the last thing I do before replacing everything back in the tub and on the counters. Afterwards, I lean in the doorway with such satisfaction, enjoying my spotless bathroom. It will only last until someone leaves a glob of toothpaste or puddle of shampoo, but for a little bit, it's just like a ritzy hotel. Aaahhhhhhhhhhhhhh. Hate cleaning, but for 20 minutes of work, it's nearly a week of "worth it." she keeps rags & cleaners under the sink (or I think you could even keep a bottle of clorox wipes which are disposable) and while her kids are in the bathtub playing, she cleans everything quickly. They're happy and out of her way and then the bathroom gets at least superficially cleaned a few times a week. Nearly a week?!?! WOW! I'm impressed. Mine only lasts until the next male goes in there. I'm STILL campaigning for my own bathroom.